Roth Sugar Bush will not sell or otherwise share personally identifying information with other people or non-affiliated companies except to provide services to you at your request, or as required by law. Roth Sugar Bush will share this information with certain business partners to provide requested service that we do not provide directly. Roth Sugar Bush will only share personally identifying information with these business partners if they agree not to disclose the information to other parties and agree not to use this information to solicit. Roth Sugar Bush may share summative data collected through its website that does not personally identify any party with our research partner, and may from time to time share this type data with other business partners. Roth Sugar Bush may disclose specific information upon governmental request, in response to a court order, when required by law, or to protect our or others’ rights, property, or safety. We do not provide information to these agencies or companies for marketing or commercial purposes. From time to time, Roth Sugar Bush website users may be asked to participate in voluntary surveys and polls. As a part of this process you may be asked to supply personal information such as demographic information and lifestyle preferences. These surveys will be strictly voluntary and you can choose to disclose this information or not. to conduct research for other purposes related to Roth Sugar Bush core business. In no case will Roth Sugar Bush use personally identifying information for its own use or the use of any other party, except to provide the services you request or as required by law. 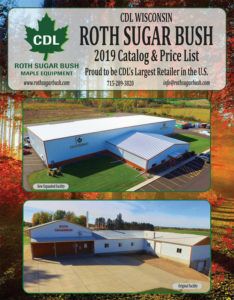 Roth Sugar Bush only reviews usage of our online content in the aggregate (meaning information summarized into large groups of users with no personally identifying information) to determine the most popular website features and to help us develop new content and service ideas. Parents should always supervise their children while online. The Roth Sugar Bush website is not designed nor intended to collect personal information from children under the age of sixteen. So that we may comply with the Children’s Online Privacy Protection Act, we ask that children under the age of sixteen not provide any personal information on this website. Roth Sugar Bush has partnered with Global Pay Direct to offer safe and secure credit card and electronic check transactions for our customers. Questions and Comments We value our customer’s perspective and welcome any feedback that you may have. If you have any questions or concerns, please feel free to contact us.